French anti-mass migration presidential candidate Marine Le Pen faces a loss of her parliamentary immunity and an investigation over tweets she posted of Islamic State violence in 2015. As anti-mass migration Front National leader Marine Le Pen continues to climb in the polls against her rivals, the European Union (EU) is pushing for her lose her parliamentary immunity. The request to remove her immunity revolved around several tweets made by Ms. Le Pen in 2015 in which she posted pictures of Islamic State violence, Reuters reports. The EU legal affairs committee was approached by the French judiciary who requested the lifting of the immunity. Though the request was approved, another vote will be taken by the entire EU parliament to finalise the motion. 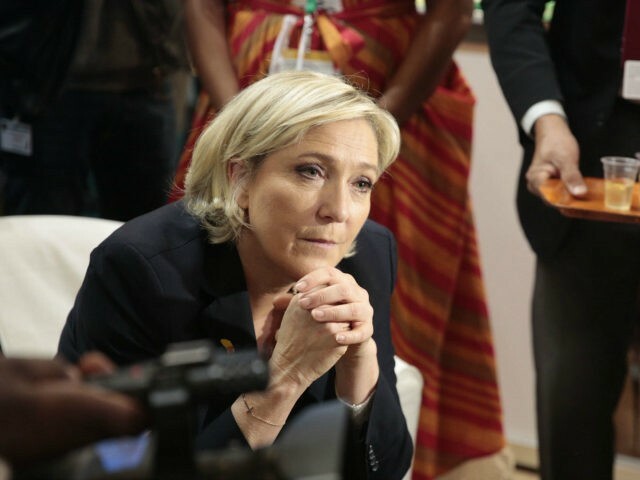 If the immunity is fully revoked, Le Pen could face a fine of €75,000 and up to three years in prison for “publishing violent images”. The charges would not be the first to interfere with Le Pen’s presidential campaign as the EU has also alleged that she paid two staffers EU funds for “fake jobs”. Police raided the headquarters of the Front National in February while Le Pen was travelling to Lebanon where she made headlines for refusing to wear an Islamic headscarf when visiting one of the top Islamic figures in the country. Due to her rise in second round polls, some European politicians have sounded alarm bells over a potential Le Pen presidency. Former Italian Prime Minister Enrico Letta said a France under Le Pen could mean “game over” for the entire EU project. Le Pen announced earlier this month she would campaign to take France out of the bloc saying it was time to “build another Europe, whether Madame Merkel, monsieur Schulz or the other Commissioners want it or not”.